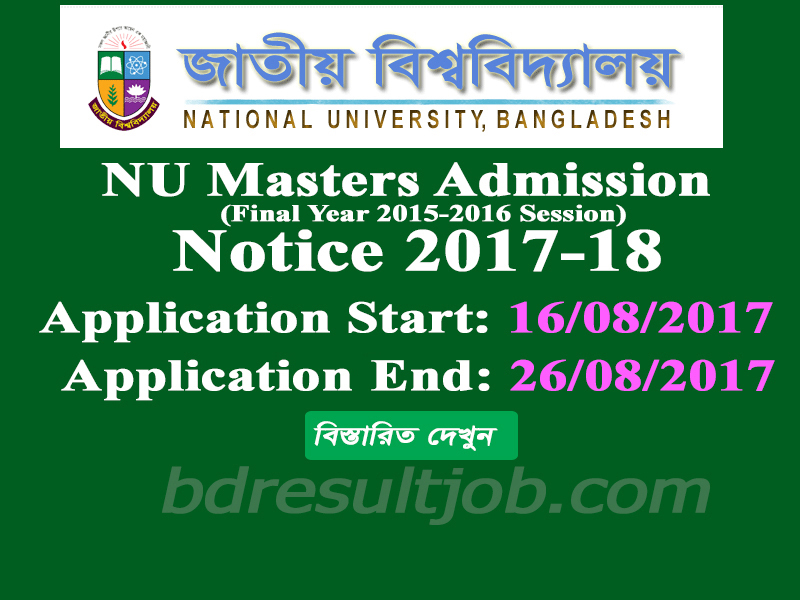 National University Bangladesh Masters final year admission 2015-2016 session circular has been published. Application start at 16 August 2017 to will be continue up to 26 August 2017. Every eligible student can apply below instruction. a. 4 (four) years honors pass from National university. Any Interested and eligible applicant apply through National University official admission website www.admissions.nu.edu.bd hor nu.edu.db/admissions. b. www.admissions.nu.edu.bd visit and select masters tab. c. Input your Honors or Masters Preliminary Roll, Registration Number and Passing year. d. Go to next page and fill up the application form with required information. e. Select your college and subject from option panel. f. Upload your Photographs; Input your Mobile Number and Quota Information. g. Preview your application form and submit it. h. Finally, print out the application form and color to A4 size paper and submit it at your college with required paper and admission form fees. 1. Photocopy of Honors’/Masters Preliminary Tabulation Sheet and Others. Master’s final year admission result after deadline over will be published Natiaonl university admission official website www.admission.nu.edu.bd or nu.edu.bd/admissions. Also you can found your result Mobile Phone SMS system. Tags: nu notice. national university masters final year admission 2015-16. www admissions nu edu bd. nu bd masters final year admission. masters final year admission 2015-16. masters private admission 2015-16. masters final year admission. Masters admission result 2015-16. nu masters admission result. www nu edu bd/admissions 2015-16. masters final year admission result 2nd merit list. nu masters admission. Nu masters admission result 2015-16. masters final year admission result. www nu masters final year admission. prily masters relieslip result. nu edu admission result 2015-16. national university admission masters. 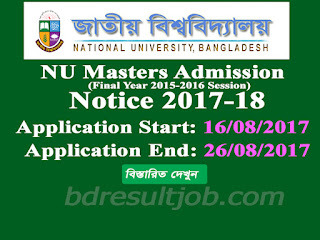 masters final year admission result 2015-2016. nu edu bd admission result 2015-16.